Throughout the world, Irish people are commemorating the Easter Rising of 1916. Films, documentaries, performances, exhibitions, and newly-written books on 1916, the people and the events, are everywhere. 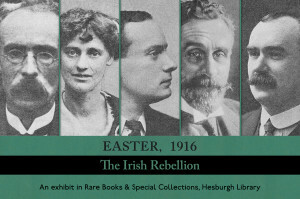 The University of Notre Dame has made a very important contribution with the three-part documentary by Professor Bríona Nic Dhiarmada, 1916: The Irish Rebellion. At the Hesburgh Libraries’ Rare Books and Special Collections, an exhibit of books, manuscripts and ephemera is on display until April 28th. Easter, 1916: The Irish Rebellion features books by leaders and participants, a very rare copy of the poem Easter, 1916 by W. B. Yeats, a letter from Sir Roger Casement, and a manuscript record of South Bend residents’ subscriptions for an Irish Government bond. Information on hours and tours is on the Rare Books website. Last lines of a 1914 letter from Mary Colum seeking money for arms.